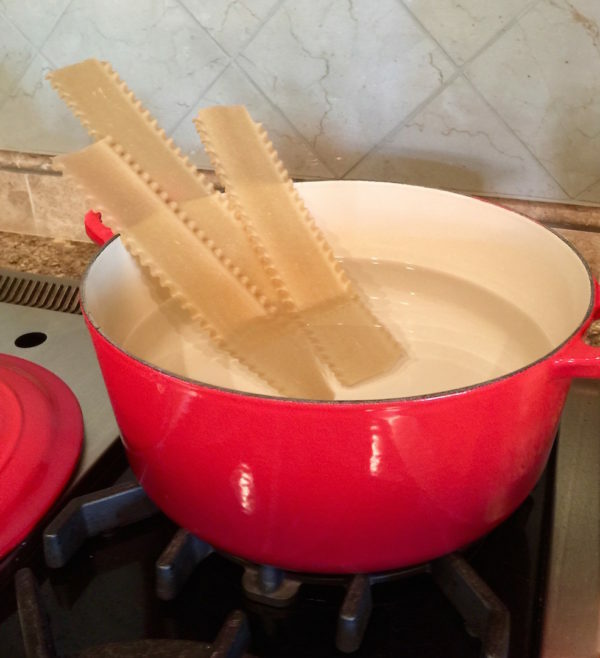 At our house, we LOVE our pasta! The FODMAP diet can put a slight cramp in that if you let it, but no need as there are delicious brown rice-based pasta noodles that make Italian cuisine very doable. This lasagna is easy to make and FODMAP-friendly, and SOOOO good! It’s also great to pack for a hot school lunch and to freeze for quick meals later. 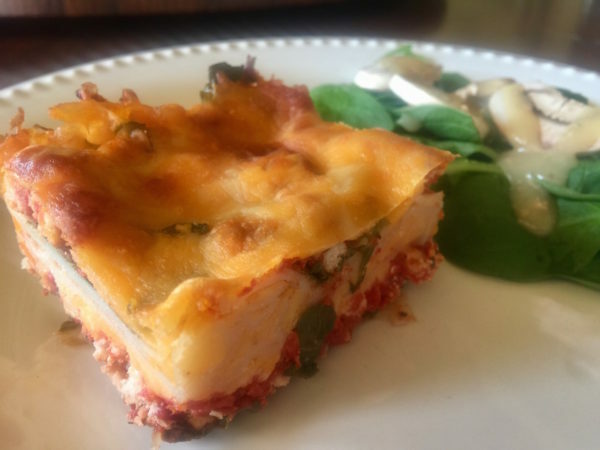 Even if you’re not dealing with GI issues or following the FODMAP diet, this lasagna is a terrific healthy alternative to typical recipes. There are no additives, and, while garlic isn’t FODMAP-friendly, it can always be included if that’s not a concern in the turkey mixture since it has other health benefits. Layer 1: Cook 9 brown rice lasagna noodles (Whole Foods carries them) until al dente per package directions, then drain and rinse with cool water. Layer 2: Chop 6 cups of organic baby spinach. Brown turkey in olive oil on the stove for approx. 5-7 minutes until done. Then, add tomato puree, basil and salt, and simmer for 3 minutes. Spray 9×13 baking pan with olive oil. Place each layer in pan. Arrange 1/2 of the noodles in the bottom of the pan, layer spinach on top, then add a layer of turkey mixture, followed by 1 cup of tomato puree and 1 cup of cheese — repeat. We had two complete stacks of noodles, spinach, turkey mixture, tomato puree and cheese, finishing with cheese on the top. 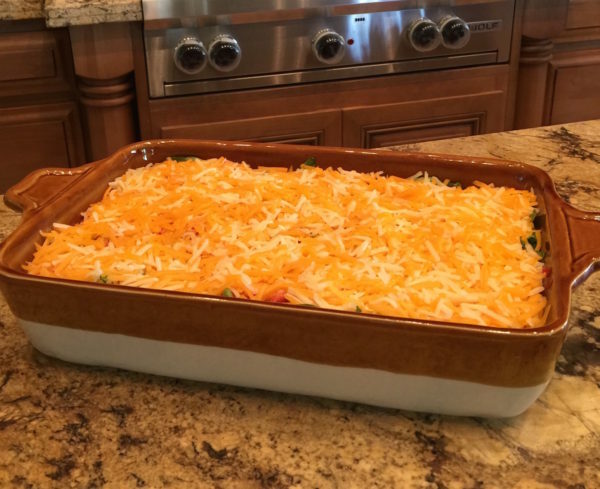 Bake for 25 minutes at 375 degrees or until cheese is bubbling on top. Cool about 5 minutes before serving. 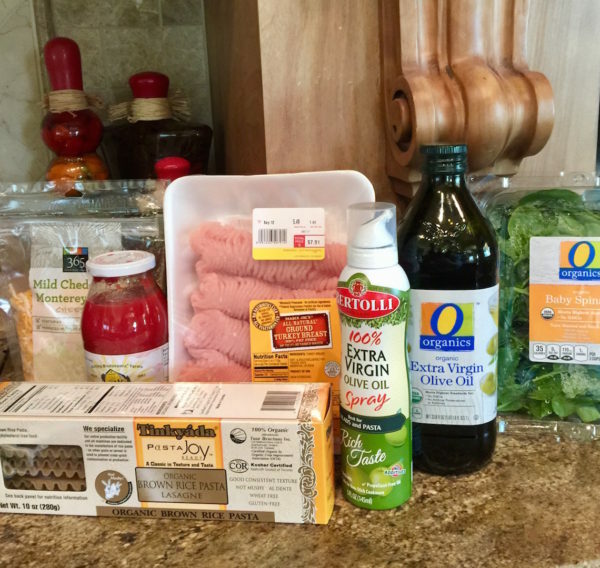 More on our family’s elimination/FODMAP diet journey here. Plus, check out our Lifestyle section for more recipes and other dietary information (from special GI diets to living with food allergies), as well as other lifestyle topics. P.S. Do you have any “total elimination or FODMAP” recipes you like? Please share!! Email me at angela@momstylelab.com. P.P.S. What exactly does FODMAP mean? The FODMAP diet focuses on a large group of dietary sugars called FODMAPs, which stands for Fermentable Oligo-saccharides, Di-saccharides, Mono-saccharides and Polyols. These sugars are often poorly absorbed in the small intestine and ferment causing bacteria and gas. After a few months on the elimination diet, my daughter Christina’s doctor switched her to the FODMAP diet, which combined with the right antibiotics got rid of her bacterial overgrowth. She has been instructed to remain on the FODMAP diet as long as possible to maintain her GI health and balance. Editorial Note: Please note that I am a mom — not a doctor, dietician or nutritionist — so am not trying to give advice, but rather just pass on my own learnings in the kitchen. The recipes I’m sharing may not work for everyone or every elimination or FODMAP diet.